CALL FOR ARTISTS IS NOW OPEN! We are bursting with excitement to announce that our call for artists to take part in our second annual curated gallery show is NOW OPEN! Submit your work now and be a part of TPRFM history! 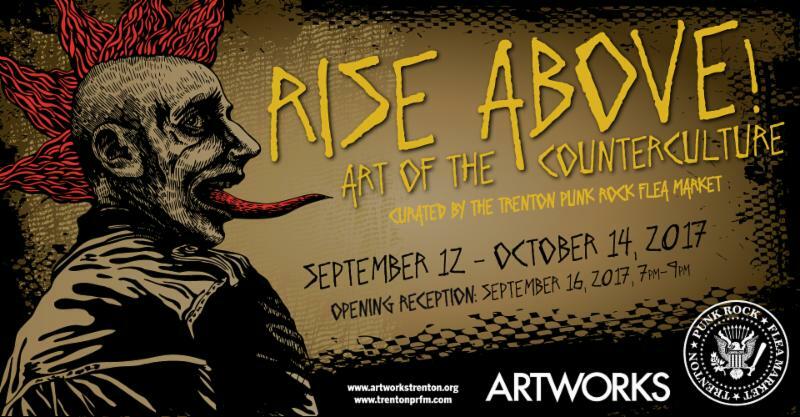 Curated by the Trenton Punk Rock Flea Market, Rise Above: Art of the Counterculture shines a spotlight on punk's current impact on art. This show will feature dozens of counterculture artists who aspire to swim upstream & rise above the common expectations of art with divergent ways of thinking and a strong DIY ethic. All forms of art will be considered including traditional mediums such as paint, photography, illustration, sculpture etc. We will also gladly consider anything out of the ordinary including skateboard art, graffiti, tattoo flash, flyer art/show posters, record cover art, silkscreened posters, sculpture, taxidermy/bone art and more. Please note, you must be the artist of the piece you are submitting! Open call for artists will close on Friday August 4, 2017.